David Coulthard (l) believes Jenson Button deserves to be regaurded as a "great"
I do not know whether Jenson Button has decided to walk away from Formula 1 at the end of this year. But if that is the way it turns out, it would not be a massive surprise. It has been a very difficult year for Button and Fernando Alonso at McLaren-Honda, with a hopelessly uncompetitive and unreliable car. Both of them have kept their spirits up remarkably well in the circumstances, but for Jenson there have been moments recently when it was clear the frustration was getting difficult to bear - and we heard examples of this during and after the Singapore Grand Prix. Alonso has two more years on a solid contract at McLaren. Button is in a different situation. He is under option to McLaren next year, and who could blame him if he felt he did not want to hang around half the winter waiting for them to make their minds up whether to keep him, as he did last year? If he wants to be in control of his own future, you could see why he might take the decision to retire. At the same time, voluntarily giving up on driving an F1 car is no easy decision for any driver. The reward it gives you is just too great to rush into something like that, especially when you are still competitive. Button is, without doubt, still delivering behind the wheel and equally he is an asset to McLaren and to the sport itself. He is one of F1's main stars - one of only a handful of drivers who, when they walk through an airport or other public place, will be recognised. Losing him would leave a void in F1 before another star emerged to replace him alongside drivers such as Alonso, Lewis Hamilton and Sebastian Vettel. 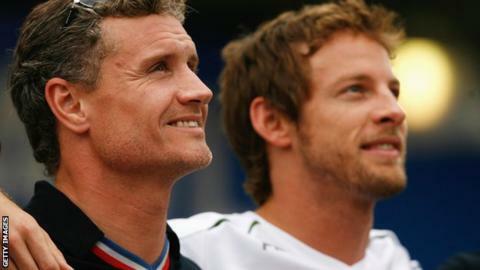 At the same time, Jenson cannot complain about the length of his career or the opportunities he has had. He has won a world championship and 15 grands prix, has earned an awful lot of money and has compared well with drivers who will go down as all-time greats such as Hamilton and Alonso. I just hope that, if he has decided to go, he gets a chance to be celebrated and clapped off the stage at the end of his career. A driver and man of his calibre deserves to be sent off with a standing ovation, not slope off into a winter of uncertainty. A couple of days after the event, Mercedes' lack of pace at the Singapore Grand Prix is as mysterious as it was at the time. They felt it was a problem with failing to get the tyres in its operating window. Yet when Eddie Jordan asked Pirelli motorsport boss Paul Hembery after the race whether the Mercedes problem was a tyre issue, he said no. But that could mean anything. I have got to believe they were just not able to get their car into the window where the tyre works. It is not so long ago, remember, that Mercedes could qualify well but struggled to make the tyres work for them in the races - that was an issue for them for three years through 2011 to 2013. The strange thing, though, is that there has been no sign of anything like this since they started dominating F1 last year, even on slow, low-grip circuits such as Singapore. What is especially weird is that in 30-odd years of watching and competing in F1, I do not remember anything quite like this - a dominant team inexplicably on one weekend suddenly being more than a second off the pace. Even the best teams with the best cars never win them all, but it was such a dramatic drop in performance as to be almost unbelievable. I suspect that we will eventually discover there was a relatively straightforward explanation. The Pirelli tyres used in F1 at the moment are particularly difficult to handle, whether it be making them work properly or ensuring they do not go off too quickly once they do work. The drivers in the last few years have talked about tyre management in a way we never really used to do when I was driving. Throughout my career, whether it was on Goodyears, Michelins or Bridgestones, you either got a balance or you did not, you drove the tyre as fast as you possibly could and the tyre degradation was consistent across the sets. F1 is a very different world now. Are Ferrari now title contenders? I suspect that at this weekend's Japanese Grand Prix it will be back to business as usual for Mercedes. If that is not the case, then clearly something else has crept up on Mercedes unawares or they have had to make some changes we do not yet know about. Vettel's victory, combined with Hamilton's retirement, has reduced Hamilton's advantage over Vettel to 49 points. But it is too early at this stage to say Vettel and Ferrari now have a realistic chance of the title. It is clear that the form in Singapore was a question of Mercedes dropping away rather than Ferrari and Red Bull making a giant leap forward, so let's wait and see what happens in Japan before we jump to any conclusions. One thing we can say after Singapore, though, is that we have had yet another piece of evidence for just what a good driver Vettel is. He has trounced Kimi Raikkonen pretty much all year - just as Alonso did at Ferrari last year - and in Singapore he was further ahead than at pretty much any race so far. If there was still any doubt about how good Vettel is - and there really should not be - his performance in Singapore and how quick he was relative to Raikkonen should finally put to bed any thoughts that he is not the real deal. Sure, he struggled a little last year compared to his then-Red Bull team-mate Daniel Ricciardo, but it is pretty clear by now that Daniel is the real deal, too. It was nice to see the penalties for some of the incidents during the Singapore Grand Prix being decided while the race was still going on. The stewards were pretty quick in coming out with their decision to give a three-place grid penalty in Japan this weekend to Force India's Nico Hulkenberg for his collision with Felipe Massa's Williams. While the speed of the decision was welcome, though, I cannot help but feel it was a bit harsh. I certainly feel the incident was more Hulkenberg's fault than Massa's. Hulkenberg could see Massa coming out of the pits. Yes, Massa was only halfway or so alongside when they collided, but equally where else could he go? He was on the apex of the corner and Hulkenberg came across into him. Hulkenberg was trying to make sure Massa lifted and he secured the place, but he should have left a wee bit more room - 'if in doubt, give the space' is the rule you have to abide by. But Hulkenberg is not a dirty driver who has a habit of crashing into people, unlike some we could mention. Perhaps a fine, which would not affect the team's competitiveness at the next race, would have been more appropriate. It is inevitable that when F1 returns to Japan this weekend, memories of Jules Bianchi and his death following the terrible accident he had in that race last year will come flooding back. The drivers will be thinking of it in a way they possibly have not been this year - even in Hungary, the race after his funeral. And I am sure it will be especially difficult for the Manor team after everything they went through that weekend and since. It is only right that we should be thinking of him over the weekend, celebrating his career and who he was, and I am sure people will be.